"The hygienist who cleaned my teeth was amazingly thorough, no one has ever spent that much time on me, plus there were no lectures or blaming. The office is the nicest and most comfortable I have ever been to. Top of the line all the way! Thanks for the pleasant experience." Our state-of-the-art, in-office Power Bleaching system will make your teeth whiter in less than 3 hours. Another option is our home bleaching system you take with you for results in 2 weeks. You can also consider a combination program of both systems for optimal, long-term results. You can have a new smile with all-porcelain crowns or veneers (empressed material) on the anterior teeth. For the posterior teeth, we use porcelain fused to high noble metal (captek) or all-porcelain crowns (Empresse, Eris, or Lava materials). Tooth-colored restorations are shade matched to blend with your own distinct tooth color. You should have a recare exam with an oral cancer screening, at least twice a year alone with a cleaning to maintain your oral health. 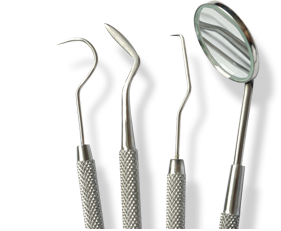 If you have had a significant time lapse in your dental treatment, the doctor may recommend a periodontal treatment, which may include either a debridement or periodontal sealing and root planning (requires anesthestic). Whether you are an athlete or casual sports participant, you should wear a mouth guard to protect your teeth. If you grind your teeth while you sleep, a bite guard will help reduce symptoms of Temporomandibular Joint (TMJ) Syndrome. We custom make mouth guards in both soft and hard materials. To replace your multiple missing teeth, a partical or complete denture are fabricated by our highly trained lab to fit your individual needs. There are several options of denture materials (Valplast, Vitalium bar, Acrylic) that may be discussed with the doctor before the final fabrication.